It is estimated that soy is one of the eight major food allergens among children and adults in the United States. A soy allergy is a reaction to soy and any food or dietary substances containing soy. Symptoms can range from mild to severe, depending on the reaction of the immune system. The most severe reaction is anaphylaxis which can be life-threatening and requires immediate medical attention. A soy allergy can trigger a reaction to proteins, causing the immune system to produce antibodies to those proteins. When you come in contact with soy, the immune system receives a signal from the body to release histamine and other chemicals that cause a range of symptoms,some of which are mild while others can be severe. Infants can develop an allergy to soy which can develop within three months of birth. In most cases, they will outgrow the allergy by the age of two. Symptoms of infants with a soy allergy include irritability, crying and blood-streaked stool. Some infants may also display a lack of weight gain, diarrhea and vomiting. If you experience any food allergy symptoms after eating soy or foods containing soy, or suspectyou may have the allergy, your doctor can perform tests to determine an allergy. If at all possible, see your doctor while experiencing a reaction. You should seek immediate medical treatment if you develop any symptoms of anaphylaxis, including flushing and inability to swallow. Your doctor will first perform a skin prick and expose the area to the potential allergen. A rash will form in the area of pricked skin if you are allergic. If there is no reaction, then an intradermal test will need to be done when the allergen is injected into the skin. Your doctor can prescribe a blood test to determine your allergy. A blood test looks for antibodies present in the blood to the specific allergen. In some cases the doctor may directly expose you to the allergen through ingestion under the doctor’s supervision. Then it’s waiting for a reaction and documenting symptoms. There can also be a double-blind test in which the allergen is disguised with other foods. The doctor will ask you to eliminate certain foods from your diet for a specific period of time. Once that time has passed, usually a few weeks, the foods are re-introduced one at a time, looking for a reaction. 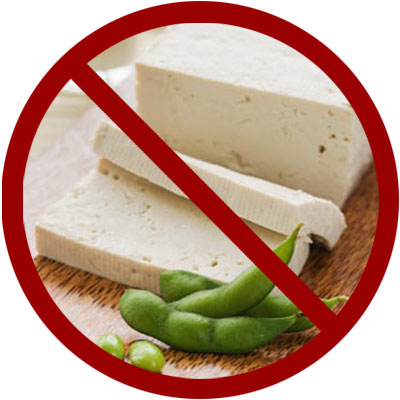 The only solution for a soy allergy is complete avoidance of soy and any foods or dietary supplements that contain soy. Reading labels and educating yourself can help with avoidance of soy ingredients. If eating out, be sure to ask the wait staff about ingredients and food preparation. First, let’s see what foods you need to avoid eating or even touching to protect you from a soy allergic reaction. When you are shopping in grocery, always read labels before buying them. The US FDA mandates that all foods must be labeled if they contain any of the eight major food allergens. Some products, however, are not required to be labeled. These include personal care products such as shampoo, cosmetics, over-the-counter and prescription medications, pet food, and toys and craft items. Having food allergies can make eating out a challenging experience. Many restaurants cook with oils containing soy because they are cheap. But you can find and choose different cuisines that do not traditionally use soy. When dining out, ask about ingredients and food preparation to avoid any chances of getting access to soy. A small local restaurant or café is more likely to be easier for you to dine at than a large chain restaurant.